The port in Livingston where our lancha arrived from Río Dulce. 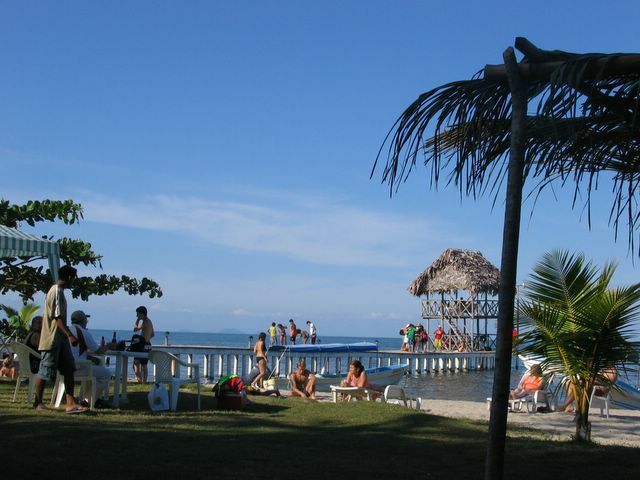 Livingston is one of the few towns along Guatemala's tiny slice of Caribbean coastline. 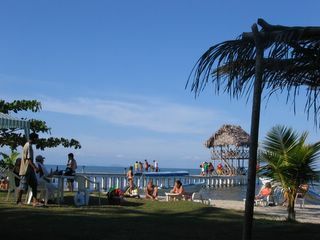 (Belize and Honduras take up most of the coast in this area) At the mouth of the Río Dulce, Livingston is only reachable by boat, since there are no roads to connect it to the rest of the country. There are some cars on the streets in the town, but most are taxis that arrived here on boats. This make Livingston a much nicer town to walk around than many other towns in Guatemala, which are often grating with the blare of car horns and the choking clouds of black exhaust. 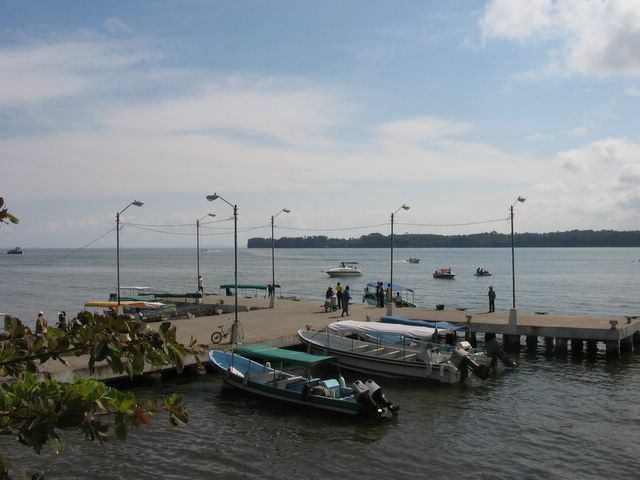 Livingston is most famous as the home of Guatemala’s Garífuna culture. The Garífuna are "Black Caribs" who are descended from 2 boats of African slaves from Nigeria that were shipwrecked in 1635 on the Caribbean island of Saint Vincent. 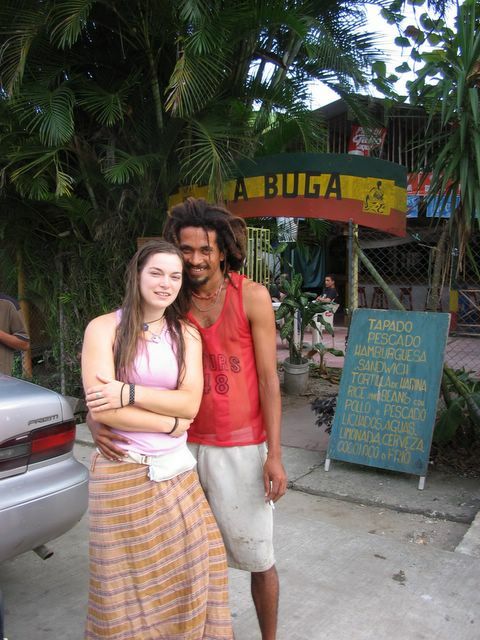 There the Africans intermarried with the native Carib culture for over 150 years. After a British invasion of the island in 1796, around 4000 of the darkest-skinned Garífuna were deported by the British to Roatán, just off the coast of Honduras. 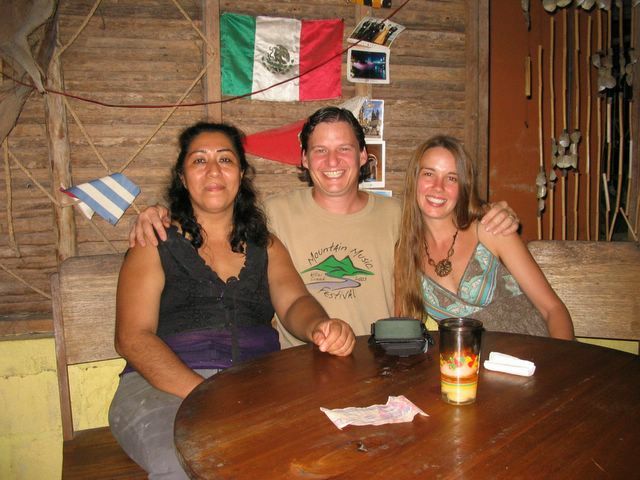 Since then the Garífuna have spread all along the Caribbean coast of Central America, from the south of Belize all the way down to Nicaragua. 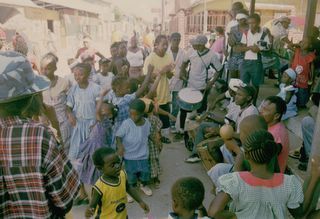 The distinct Garífuna language is derived from the Carib culture. However the majority of Garífuna people in Guatemala also speak Spanish, so we were able to communicate just fine with them. We weren’t really expecting much from Livingston, since its beaches are mostly tiny and lackluster. In fact the "beaches" within the town limit are downright polluted and definitely not recommended for swimming. We also found a great little hike from the beach up a jungle stream through a series of waterfall pools called the 7 Altars. Here we found an excellent, deep swimming hole that you can leap into from the top of a 9-foot mini-waterfall. 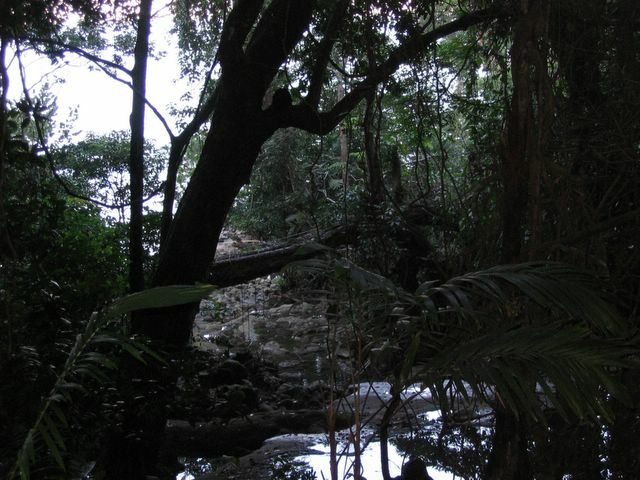 Unfortunately, it was so dark under the jungle canopy in the late afternoon that our photos didn't come out. The photo above is from the first of the "altar" pools, looking out toward the sea. La Isla del Amor (Island of Love), off the coast of Livingston. Rumor has it that if you see a candle lit on the island, there is a couple out there consummating their love. What we really dug the most about Livingston was the warm and friendly vibe of the people...not to mention the delicious food, which is much tastier than typical Guatemalan food in other parts of the country. 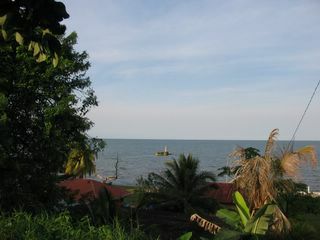 For example, seafood, coconut milk and bananas go great together in a local soup known as “topada”. María, an immigrant from Mexico who spent a number of years living in India, makes a fantastic topada. 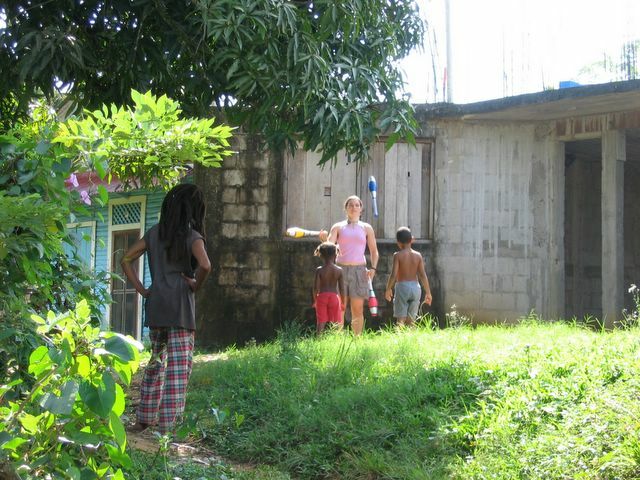 She runs a great little restaurant near the beach featuring Asian-Caribbean fusion cuisine. She is exceedingly charming and friendly, and she insisted on buying us a free round of drinks when we told her we'd gotten married a few months ago. Did we mention how much we dug the warm, friendly vibe of the people? We seemed to recieve a much friendlier, more genuinely warm reception than we have from locals in most other parts of Guatemala. Danny was one of the first to welcome us to Livingston. He helped us find a good deal on a hotel room and then took us on a tour around the town. 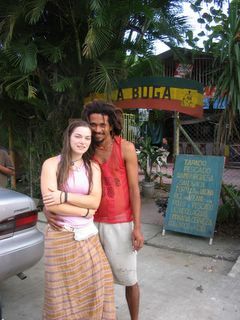 He also took an immediate liking to our traveling companion Jessica. 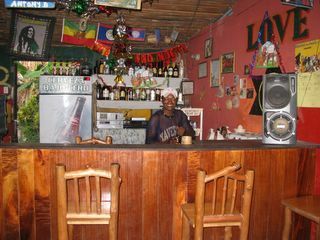 Danny is the owner of the Ubafu Bar ("ubafu" is Garífuna for "power"), and if you're there on the right night you can see local "punta" bands. 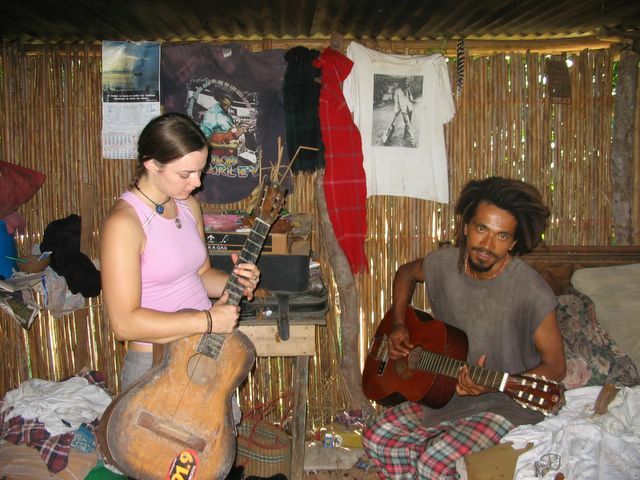 Punta, the local Garífuna music, is a very nice change of pace from the incessant merengue and reggaetón (a Latin American form of hip-hop) that is so popular in the rest of Guatemala. 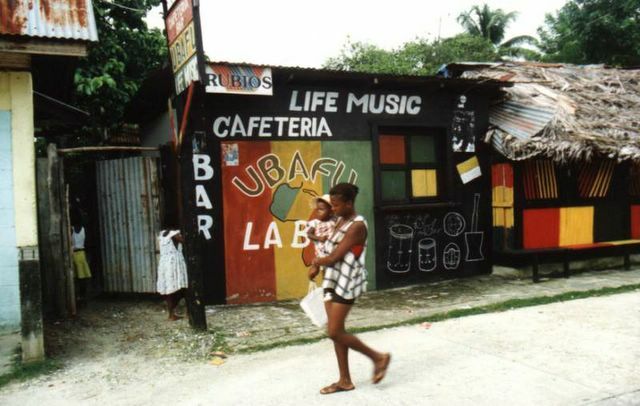 Punta has a much more Afro-Caribbean feel, with lots of drums. Danny made us some mix CDs of punta music take home with us, since it's difficult to find outside this little corner of the world. Johnny was another local who took a liking to Jessica. Johnny gave us a more thorough, back-alley tour of the town than Danny did. We followed various dirt trails through a school, a cemetery, people's back yards, etc. 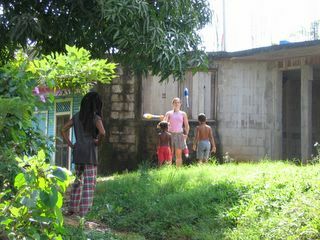 In the photo above, Jessica entertains some local kids with a juggling act in their back yard. 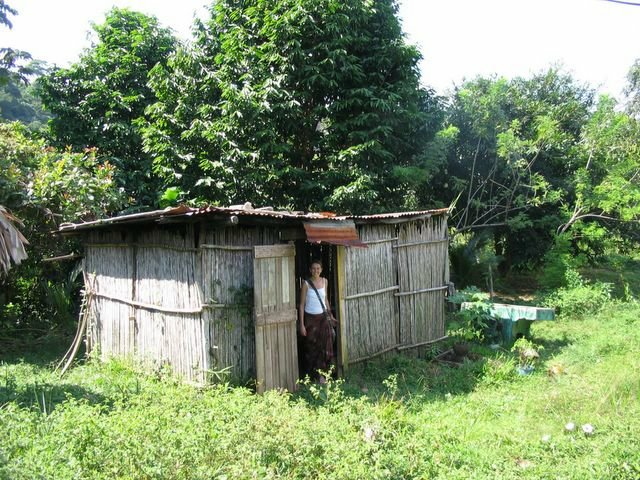 Eventually we arrived at Johnny's tiny hut on the outskirts of town. Jessica and Johnny jam out at Johnny's place. Depite appearing to have only 1 string, the guitar that Jessica is playing actually has 2. We spent 2 very relaxing, enjoyable days in Livingston. The late-December weather was perfect for us: not too hot and muggy, as it can be on the coast in other months of the year.